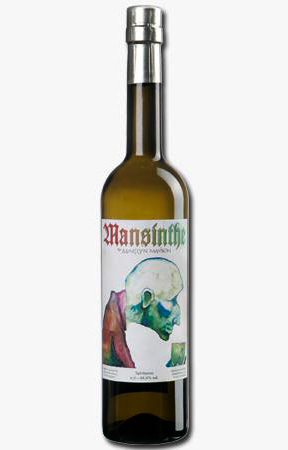 By now, you've probably all heard of the Marilyn Manson's absinthe unfortunately named Mansinthe. Yes, it's a gimmicky name. And a gimmicky alcohol content (66.6%? Really?). Which is all obviously a ploy to sell more bottles and increase attention, especially to people who don't drink a lot of absinthe. But look past all the gimmicky stuff, I'm telling you. This is a true Swiss-style Absinthe made as a collaborative effort between a German producer and a Swiss distiller, using Marilyn Manson's input, artwork, and name. I'm actually kind of sad I haven't taken a picture of the color of this absinthe both pre- and post- louche as it really is quite beautiful, which is weird since I've gone through about half a dozen bottles since its release. Regardless, Mansinthe initially pours a crystal clear bright lemon-lime green color. It really is quite striking and brightly colored. It louches remarkably well, with an impressive bit of swirling as the color shifts to an opaque gray-sea green color. I've tasted a couple dozen absinthes, and Mansinthe still has my favorite louche. After the louche, Mansinthe explodes with deep, earthy aromas of anise, fennel, wormwood, and hints of white tea and perfume. The aroma is quite strong (which is a good thing for absinthe) and you can easily smell it across the room. Tasting brings an upfront bit of mouth-numbing absinthe goodness, with earthy wormwood, tons of anise and fennel, sweet tea, and mint. The finish is long and lingering, with the numbing effect staying in your mouth for a good minute. This is a drink to be sipped and savored, mixed 2:1 or so with water, and served out of a proper absinthe glass. It's sweet enough that I actually prefer it without sugar, although I don't have much of a sweet tooth. Easily one of my favorite absinthes and one of the few which I've purchased repeatedly. Drink This: if you want a tasty, true Swiss Absinthe and can look past all the gimmicks. I actually enjoy the label artwork. Don't Drink This: if you're going to take it as shots or light it on fire. That's just a waste of a great beverage (and at around $60-70 a bottle, that makes you an idiot, seriously). "mixed 2:1 or so with water"
I would highly recommend the "or so" part of the above. Many absintheurs prefer 3 to 5 parts water depending on the proof of the absinthe. If you want to get technical many people try to hit 12 to 15% final ABV. There's a handy graph over at The Wormwood Society. I appreciate Mr. Manson taking the time and contacting the right people to make an authentic absinthe. He could've just thrown together some Czechsinthe style fakery and made a bundle by doing it cheaper. I'm more than willing to forgive the bottled proof of the absinthe for that. I know a lot of people mix it 3-5:1, but I enjoy absinthe slightly stronger and typically without sugar. I also prefer bourbon and scotch that's 100+ proof for drinking neat. But, that's just my preference! But yeah, I agree that it's a great thing that MM decided to make an authentic quality absinthe. Like I said, it's one of my favorite absinthes. I've gone through quite a few bottles of it! I appreciate your reply and for linking the graph!